CONTENTS: Reference based color measurement | Test with a similar system | Color identification, not color measurement | Two varieties | Why is this important? The X-Rite Color-Eye works with a calibration card, a smartphone and an app. 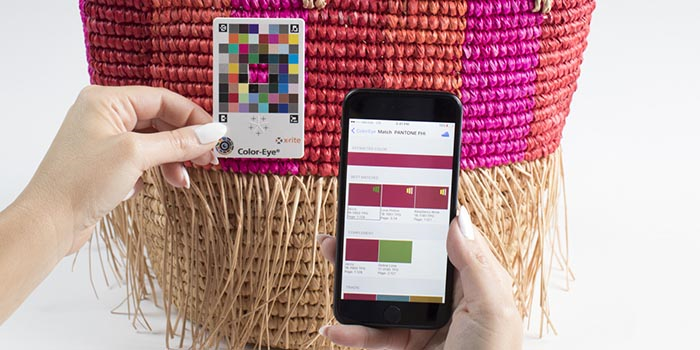 This method is sometimes called ‘reference based color measurement’: it uses a reference with known colors to calculate the value of the photographed sample. The calibration card has 85 ‘known’ colors and a hole in the middle. Based on these known colors, the app can calculate the color photographed. X-Rite does something similar with the camera calibration tool ‘Color Passport’, which is also a card with known colors. After having shot a ‘calibration picture’ including the card, the software will adjust the picture colors to the real life values. But to use such a card to measure colors, that’s something different. 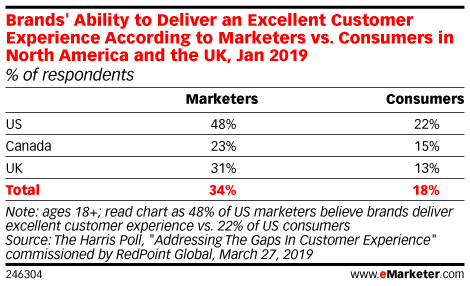 Some five years ago, I tested a similar system, by a different vendor. And the results were not promising, the system never was launched. One of the problems was repeatability, linked to the way the smartphone was positioned compared to the calibration card: a slight shift in angle would give a different measurement. Measuring the same color a number of times under a different angle gave differences up to a delta E of around 10 (if I recall correctly). 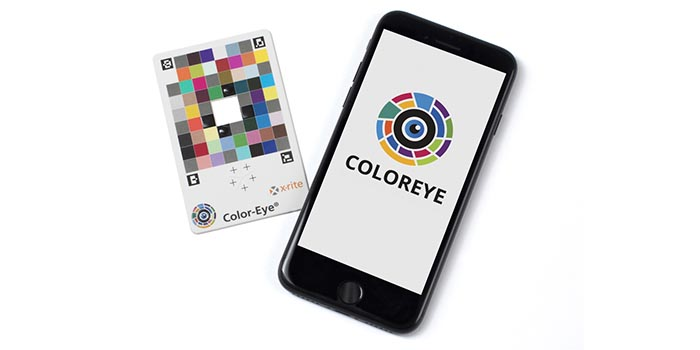 Fortunately, the X-Rite Color-Eye has a – rather simple – solution to this problem: the app will guide you to hold the smartphone in the right position, based on four calibration points on the card. Also, there is a limitation to the smartphones used: only ‘certified’ devices can be used. They need to have a good camera, a good flash and RAW picture output. Among the certified devices are the latest, top of the line, iPhones and Samsung smartphones. But make sure to check this list upfront! And then there is that other important fact: it is not a color measurement device. It is a color identification device. Confused? Here is the difference: a color measurement device will give you an exact measurement value, e.g. in CIELAB. A color identification device will identify the photographed color as one of the colors in its database, e.g. a database with all kinds of colors of nail polish. The app will check the photographed color with the database of the cosmetic company with all the different colors of nail polish. And it will give you the color that is the closest to your sample. As you can see in this picture, the app will give three possible matches. The X-Rite Color-Eye is a solution that is geared to a very specific use (color identification), in a very specific environment (every application will have its own color database). It is not a general tool. But within the known constraints, it might be an interesting solution. Certainly from a more technical perspective, it’s something interesting. But I don’t think that ‘reference based color measurement systems’ will soon be a solution to really ‘measure’ color. So you better cherish your spectrophotometer… You will need it for the time being. 2 Comments on "X-Rite Color-Eye: color identification, not color measurement"
Intersting article. Did you ever test the solution provided by Techkon? 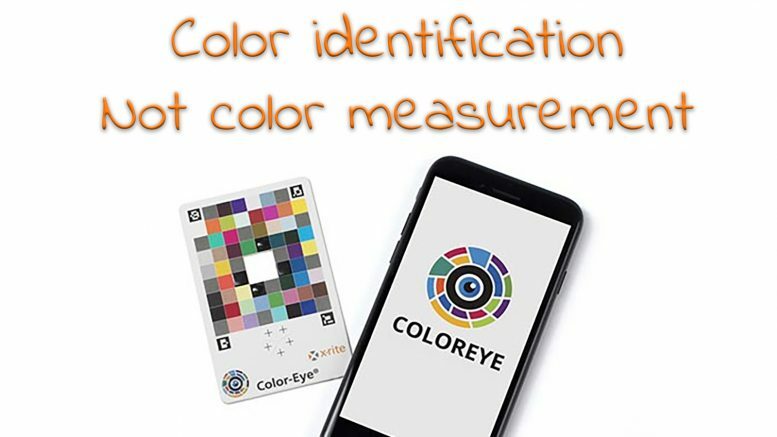 This German producer of density measurement devices ans spectrometers introduced a color control device based on smartphones and color cards. They addressed the cosmetic and food industries and made specific color cards for coffee colors and another one for skin tones. The system called Color Catcher provideds RAL-values, sRGB-values and – as they claim on their site – Lab-values. Hi Henk, I didn’t test the Techkon Color Catcher. But the one I tested, half a decade ago, looked very similar. And based on that experience I would be cautious. Their claim that it delivers ‘precise Lab-values’ might give people the idea that it’s a replacement for a – much more expensive – spectrophotometer. Which is probably not the case (but, as I said: I did not test the Techkon Color Catcher, so I can not give a formal judgement). And that’s what I like about the X-Rite Color-Eye: they give you three possible matches from a specific color library, with a certain degree of a match, not ‘precise Lab-values’. That’s realistic, that’s what you can expect from this kind of tool.